Collaborator is a mobile application prototype. It aims at helping students in the same educational institute to find collaborators cross departments. 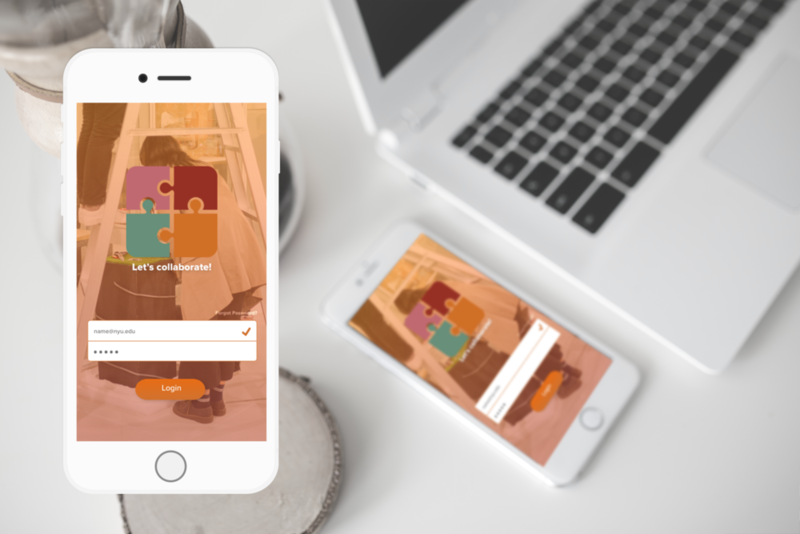 A user can log into this app either post a project idea and look for collaborators with certain skills, or find a project that requires skills he has to become a collaborator of others. How can I find my collaborator? As a student who is interested in emerging technologies and new media arts, I am always trying to express my understandings about this world by combining different technologies, art and media formats. However, as I am eager to explore new approaches to express my ideas, I also constantly encounter the problem of not having enough experience in a particular area I am interested in. So I always have this idea to collaborate with other people. I want to contribute what I am good at and at the same time learn from my teammates who are experts in things I am less experienced with. However, I sometimes find finding a collaborator not an easy mission. For instance, if I want to build an interactive installation. and I am most experienced in physical computing and less experienced in visual design or fabrication. I really want to collaborate with some people who have strong visual design skills and fabrication skills. However, when I ask around, people who are available are not quite strong in terms of visual design or fabrication, yet the strong candidates have different schedules with me and could not spare time to collaborate. I also send emails in my department email list and ask people to forward things around, but sometimes people just do not really read emails. Anyway, various situations make finding a collaborator really difficult. So a strong willing just emerges from the bottom of my heart “I want a platform where I am able to find partners!” I really wish there is one in my school which could allow me to post a collaborator request to all students on campus and also potentially allow me to become collaborators of others. When you need to find collaborators, what do you often do? What tools or approaches do you use? Among those tools or approaches, which one is your favorite and why? Are you satisfied with the current tools you have to find collaborators? Are there things you want to improve? Since my targeted audience are college students who have the needs to find cross-department collaborators, I interviewed 5 students who will be the potential users. I asked about their personal experience finding partners. These students come from different backgrounds including computer science, fine arts, architecture and design. When they are creating projects, they often run into the need to collaborate with other people. The most used approaches people use to find collaborators outside their own majors is either by asking a friend to recommend candidates or sending emails to other majors’ email list. The first pain point is that the current methods (asking friends/sending emails) are not efficient enough. Asking a friend might end up taking a lot of time - what if my friends do not know anyone I know? And passing emails around might lead to a situation that people do not reply efficiently. The second pain point comes when there are several candidates to choose. Since people are collaborating with people outside their our area of studies, if they have multiple potential collaborators to choose from, sometimes it might be tricky to decide the most ideal candidate. How do I make sure this person has the right skills I need? How do I know someone will be a better collaborator than someone else? Though talking to each individual helps to make a decision, Still, is there any better method besides that? Through my research, I found a student-oriented organization (web platform) at Tisch School of the Arts at New York University which aims at fostering student collaborations. Although the platform claims to foster collaboration among various departments, they are more targeting towards majors related to performing, acting and video production. Other majors like Interactive Telecommunications Program or Game Design, which focus more on design and technologies are less included. It solves the "collaborating-matching problem” by providing portfolio and resume of the talent. TTG has provided a great platform for students in different majors to gather together and collaborate. It serves the purpose of both searching for projects and collaborators. It also have a great talent pool in which people showcase their talents by providing resume or portfolio. You have to send an email once you find an ideal collaborator, still not efficient enough. The “project” and “stories”, “collaborator” and “talent” sections are a bit overlapping. When clicking into a project page, the information hierarchy is a bit messy. Once you find a project you are interested in or an ideal collaborator, you will still have to go through the “send an email and wait” process. You have to move from one platform to another in order to get into connection with people. In terms of information spreading, website platform does less a good job than mobile apps. 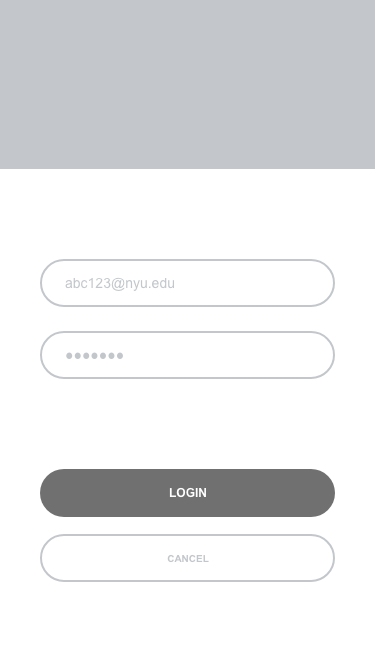 Based on the user research and existing platform research, I decided to create a mobile app which foster collaborators among students in different majors in Tisch School of Arts at NYU. 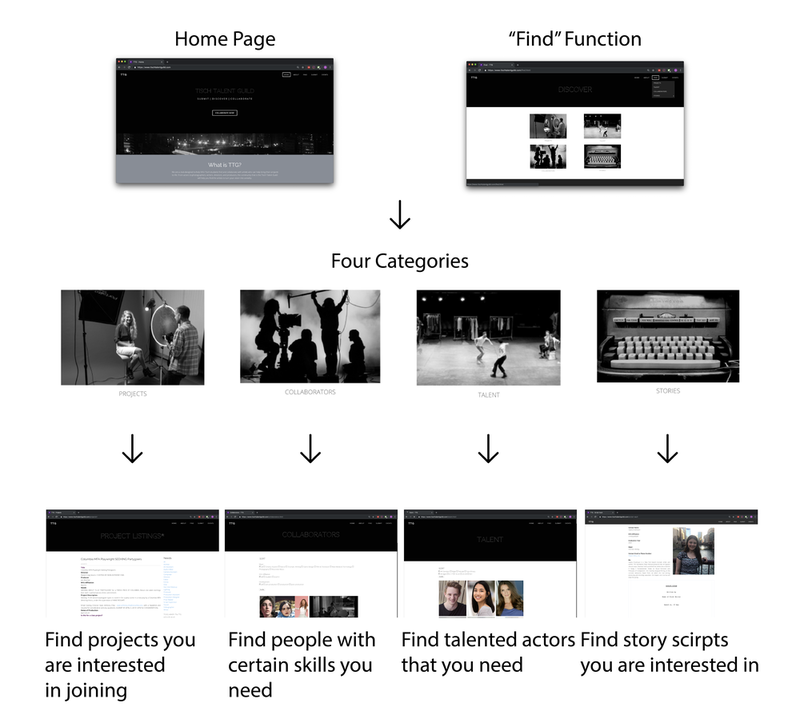 The user can use it to find projects they are interested in or collaborators they need. The choice of mobile app is made because of the belief that communication via mobile apps works more efficient than on a website. 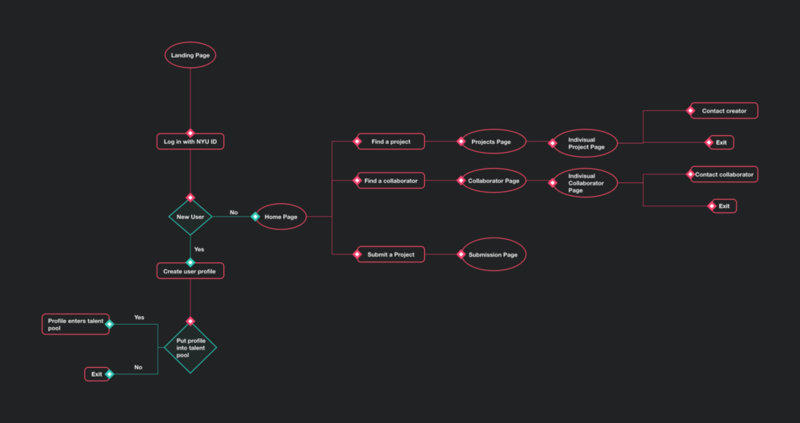 Based on this user flow, I used Balsamiq to create some wireframes for user testing. I designed three scenarios for my users to test the app. You are new to this app. You are creating a dance and technology project. 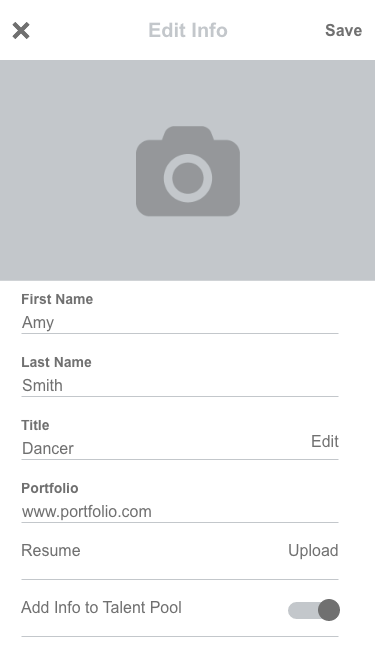 You would like to use this app to find a dancer. You are an actor. You currently are not engaged in any show. You go on this app to see if you will find some projects you are interested to participate in. You have a cinema project proposal, you want to use this app to post your idea and see if it will attract some people to collaborate with you.